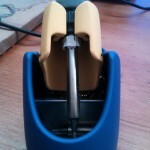 This is a re-write of my review of the Hakko Fx-888D review, thanks to some brilliant people giving me feedback on the EEV Blog Forum – link to thread here. 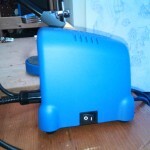 So recently I picked up a new Soldering Station: the Hakko Fx-888D. This soldering station is a more substantial and robust iron than the one I had been using previously and is priced at a nice £100 ($150), so it’s a good price for hobbyists! Specifications: For it’s price, the Hakko boasts some impressive specs! 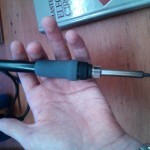 It is a 26V 70W iron with temperature control between 200ºC and 480ºC. At idle temperature it has an accuracy of ±1ºC. It features a useful preset mode, and password protection functionality for if you need it. 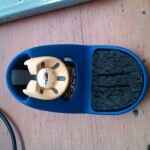 As well as being ESD (electro-static discharge) safe and isolated from the mains. The heat up-time is a handy 40-50 seconds (depending on the temp) and it’s thermal recovery is excellent. In the box: For the £100 you get the iron, along with a T18-B tip, the main unit, the manual, a stand for the iron, a sponge, and some brass wool (both of which fit in the iron holder. Ease of use: This is one of the easiest irons I have used yet. If you simply want to get it running just plug it in, plug the iron into the main unit, switch the switch on the side of the unit and you are away! In this mode, setting the temperature is simple, just hold down the ‘ENTER’ button until the first digit starts flashing, then use the ‘UP’ button to change the value, and the ‘ENTER’ button to move to the next digit. The other modes can be accessed by holding the ‘UP’ button whilst powering on, and using enter to select the mode. Performance: Well as expected the iron performs exactly as the specs said it would, heating from room temperature (21ºC) to 380ºC in just 42 seconds. The real-time feedback of the temperature is extremely useful because you know exactly what temperature you are currently on. There is a small LED at the bottom of the display which tells you when the iron heater is on too. The iron feels comfortable and solid in your hand but the cable is nice and flexible giving you the manoeuvrability you need when soldering. The footprint of the unit and stand is nice and small leaving you plenty of room on your bench (well, unless your bench is as untidy as mine) for working in. Conclusion: I found the user manual to be a bit unclear on changing modes, but this did not affect the iron’s usability considerably. I also found that the tip they included wasn’t the tip I personally would have chosen, as I do mostly though-hole work, but I managed to buy another tip for only £6 ($10) more. Aside from that the iron was well-built, easy to use, comfortable, and in my opinion a great buy! 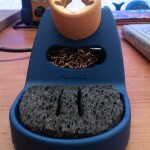 I would highly recommend the Hakko Fx-888D to anyone looking for a sub £150 ($200) soldering station. It is excellent value for money and does everything I expected it to! I am thoroughly pleased with it. Hi Tom, I’m considering buying one of these. Any new thought’s on it now that you’ve had it for a while? Anything you weren’t able to do with it? I would very much recommend buying one. It’s proved itself to be reliable and (for me) has been able to cope with every situation I’ve put it in with ease. Now I haven’t been doing really advanced stuff with it, the smallest component I’ve soldered is an 0805 part, but it was perfectly dexterous for this. It’s also proved itself with large ground plane components, though sometimes it does take a couple seconds to sink enough heat into these, however for the price this is a very small issue and barely noticeable for the majority of work I’ve done with it. I would recommend buying a couple of different styles of tip and trying them out to see which you like best, and to see which work best for certain different situations. £10 delivery charge and price is before vat. Seems like they have monopoly so they can be unreasonable. No credit cards so no right of return if you have a problem. Dancap – unfortunately not a very customer facing company. They only accept cheques or bank transfers. I shan’t be buying anything from them. I agree it’s a bit odd that they only accept cheques and bank transfers, but they were very helpful with me, and I found it quite a pleasant buying experience overall! There are much worse people to buy from! 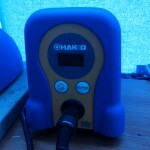 I expect you get asked this a lot, but where did you buy your Hakko from for £100.